The 8th Annual Financial Frenzy event took place Thursday, June 28th, 2018 at District 1 Community Center in Black River Falls, Wisconsin. Middle and high school students were offered real life scenarios on how to manage their trust fund money. Registered participants totaled 62 youth and 27 adults. Victoria Houghton from First Financial Credit Union referenced planning documents when saying, “The goal of the game is to have a better understanding of making life choices, the outcomes those choices bring, along with consequences that are both positive and negative.” She further explained, “The game takes youth into the world of work, military, education, or even to see what the obstacles might be if they choose to stay home and live off trust fund or per cap. Table topics for the game included a Help Desk, Bank, Court, Police Department, Child Support, Education, Life Skills, Military, Live off Trust Fund, Housing, Entertainment/Daily Living, Utilities, Vehicle Purchase, Auto Insurance, Medical Insurance, Child Care, Community Health, Financial Literacy, Dina’s Goodies, Investments, Disabilities, Credit Score, AODA, and Taxes. Tables set up in the gymnasium at N7261 Warrior Avenue were similar to that of a board game. Emcee Eli Youngthunder helped guide the youth through the day’s agenda. Mr. Youngthunder, a social studies teacher at the Black River Falls High School, added humor and shared insight to topics covered. The planning committee included a parent track in the breakout sessions this year. Ho-Chunk Nation employees were eligible to receive eight hours of paid Administrative Leave to participate in this event. Sessions covered taxation, 401K, and representatives from Providence First Trust Company explained the recent trust agreement amendment and how it affects filing children’s future taxes. The Ho-Chunk Nation Police Department presented a “Hidden in Plain Site” room. Youth were requested not to attend, allowing parents and guardians to familiarize themselves with possible drug hiding tools. Guest Speaker James W. Anderson is a speaker, trainer, and author. He is also the son of America’s Rib King, ‘Famous Dave’ Anderson. James Anderson’s main message to the youth was on how to be successful and to always remember to ask for help. Student breakout session included Clan Mothers, Financial Literacy game, and Investment 101. Myrtle Thunder–Long, Ruth White Eagle–Decorah, Marie Lewis, Barb Goodbear, Myrna Thompson, and Bernice Blackdeer led the Clan Mothers session. Michelle Cloud and Marlon White Eagle led the Financial Literacy Jeopardy game. John Fitzgibbons of Baird led the Investment 101 session. Event sponsors included First Nations Community Financial, the Financial Literacy program, Baird, Providence First Trust Company, Bronfman Rothschild Plan Advisors, Ho-Chunk Nation Department of Health, and Ho-Chunk Nation Social Services. 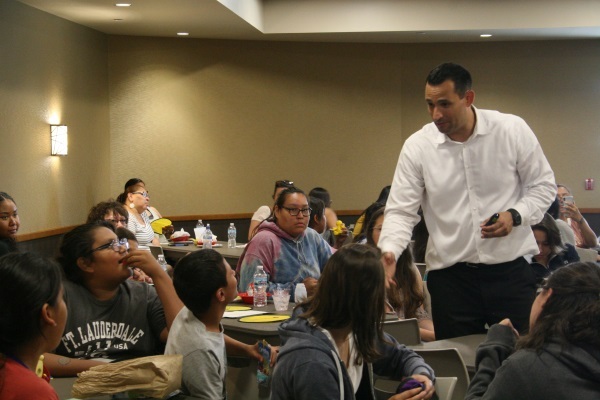 Financial Literacy provided breakfast and Ho-Chunk Nation Department of Health provided lunch. Local Businesses who helped with the game included Jackson County Electric and Co-Op Credit Union.